Shanice Abbott is investigating mental health and unemployment in the Midlands. 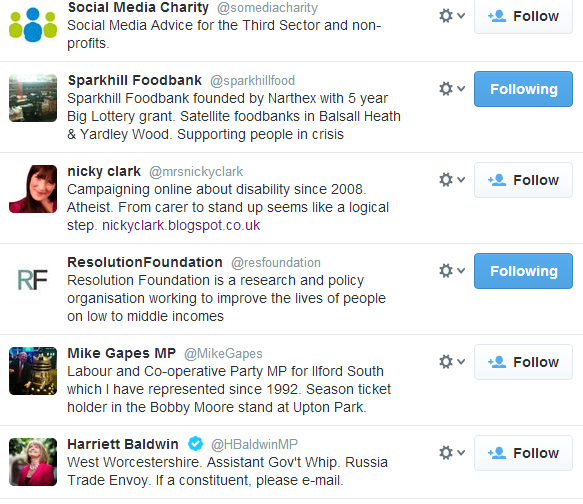 In a cross-post from her own site, she recommends 15 organisations to follow on Twitter. You can support Shanice’s investigation on Contributoria here. Birmingham and Solihull Mental Health Foundation Trust is an organisation that provides mental health care to people living in Birmingham. BSMHFT is one of the biggest mental health foundations in the country. Twitter tool FollowerWonk has a facility for searching biographies on the site – make sure you select “search Twitter bios only” from the drop-down menu. Try a range of terms: ‘welfare’ is normally used by those in official positions (or ‘social security’ in the US); ‘housing’ is a more specific term, as is ‘homeless’ or ‘homelessness’, ‘poverty’ and even ‘social’ (as in ‘social inclusion’). You might want to look for users who mention an interest in specific issues like ‘bedroom tax’ or ‘workfare’, too, or organisations like Atos, A4e, and DWP. For search methods and similar tools read this post on Search Engine People. There are a number of directories for Twitter users. WeFollow works well with a general search for welfare but adding location seems to exclude a lot of relevant results. Twellow allows you to narrow down to the United Kingdom, and particular cities, which helps exclude US results, but there doesn’t appear to be a way to use keywords and location together. There are categories but these are very US-centric – so, no welfare or benefits, and the categories for ‘low cost housing’ and ‘affordable housing‘ bring up too many irrelevant results. If you find a more effective directory please let us know! It’s likely that someone else has already created a Twitter list covering the same or a related area. One way to find these is to look at the users you’ve already found and see what lists they’ve been added to. You can also try to search Twitter lists. However, a number of tools that used to allow you to search these are no longer operating, so you’ll have to resort to some clever use of Google. …and replace YOURKEYWORD with what you’re looking for (note that there is no space after the colon). Sadly that only produces one result, because the list has to be called ‘welfare’ exactly – so this list wouldn’t match the search. This will bring back any list pages where one of the tweets mentions that term. Obviously this depends on what people are tweeting about at that moment in time. As you start to follow people in your field, you’ll come across some terms and hashtags repeatedly. In welfare for example people will be talking about the bedroom tax, welfare reform, universal credit, housing, benefits, and other issues. You can search for these on Twitter itself, or use Google with the phrase site:twitter.com (note no space after the colon) which limits results to Twitter. Make sure you use quotes to get exact phrases only – e.g. “bedroom tax” will ensure you don’t get results that mention both words in separate places. 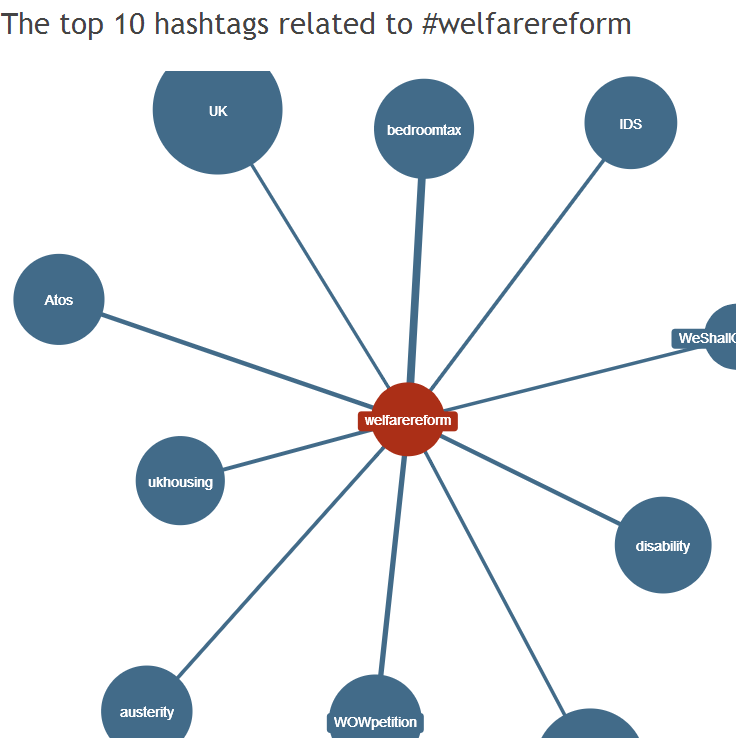 Hashtags of the same phrases are worth trying too: #bedroomtax and #welfarereform, for example are both widely used instead of the full phrase. You can also try prefixing general terms with ‘uk’ – #ukhousing, for example, is often used by those within the UK housing industry to distinguish their discussions from those elsewhere. Watch out for scheduled live chats too – #CABlive, for example, is used for discussions between citizens advice bureaus – and campaigns, like #PaydayWatch. After your initial search it’s worth trying again occasionally – you can set up regular updates for a search using Twitter tools like Tweetdeck. You can also use a tool like Hashtagify.me to find hashtags related to ones you already know. Finally, look at the people you’ve already found and who they’re following and listing. In the first part of this series we looked at bringing general news sources and blogs into one place. In this part we look to another important source: social media discussions. Social media discussions contain three types of information: news updates you haven’t seen elsewhere; expertise (analysis and insights, for example); and personal experience (case studies). If you haven’t read Part 1, go here and read it now – it contains instructions on how to get started with Netvibes you’ll need to follow first. Done? OK. That post mentioned the Netvibes ‘Essentials’ menu a couple of times – another option there is the Twitter search. This is useful for bringing social media discussions into your netvibes feeds. Neil Johnston and Fiona Parker, freelance journalists and final year students in York, have put together a list of Twitter accounts to follow for anyone interested in welfare issues in the area. You can also follow the list here. Director of Development at @TheRetreatYork , sci-fi geek, motorhome owner and lover of all things Dutch – hows that for a combination!